1. Membership maturity. The member must have remitted at least 240 monthly membership contributions with the Fund. For Pag-IBIG Overseas Program (POP) members, membership with the Fund shall be at the end of five (5), ten (10), fifteen (15), or twenty (20) years depending on the option of the member upon membership registration. a) Actual retirement from the SSS, the GSIS or a separate employer provident/retirement plan, provided the member has at least reached age 45.
b) Upon reaching age 60.
f) Such other cases which are adjudged to be total and permanent disability by a duly licensed physician and approved by the Board of Trustees. 6. Death. In case of death, the Fund benefits shall be divided among the member's legal heirs in accordance with the New Civil Code as amended by the New Family Code. "Kumikita po ng dividends taon taon ang inyong naimpok. 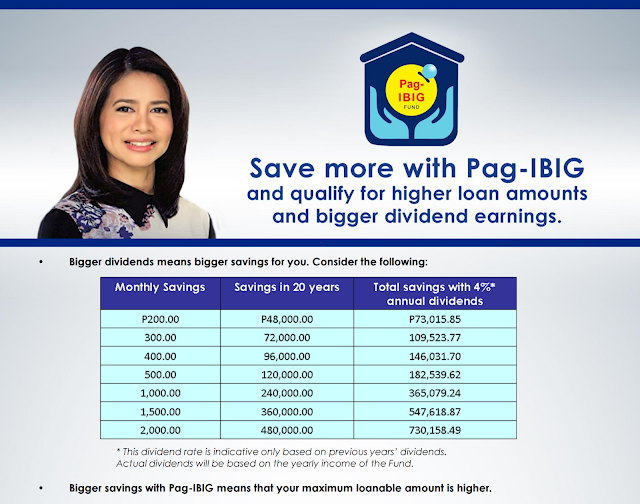 Para sa taong 2015 ang dividend rate po ay 4.8%. 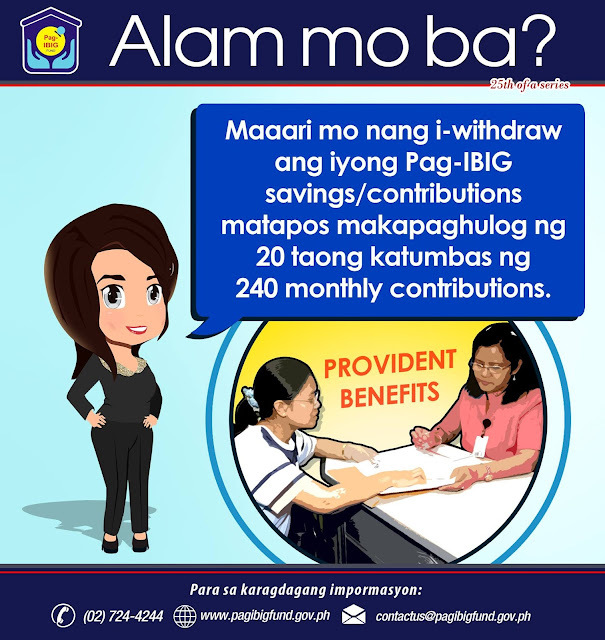 Once naging qualified po ang isang member for provident benefits claim, maaari po niyang makuha ang lahat ng kanyang contributions, employer's counterpart contributions at dividends nito." Ito po ay ang aming provident benefits claim under 10 years maturity period. Kung nakompleto po ninyo ang 120 monthly contributions na walang gaps o palya at ika-10th year na po ng inyong membership at walang existing loan, maaari po kayong mag-avail ng provident benefits claim - 10 year maturity period. Ito po ay applicable sa mga nagsimula maging member ng taon 1995 - 2009. 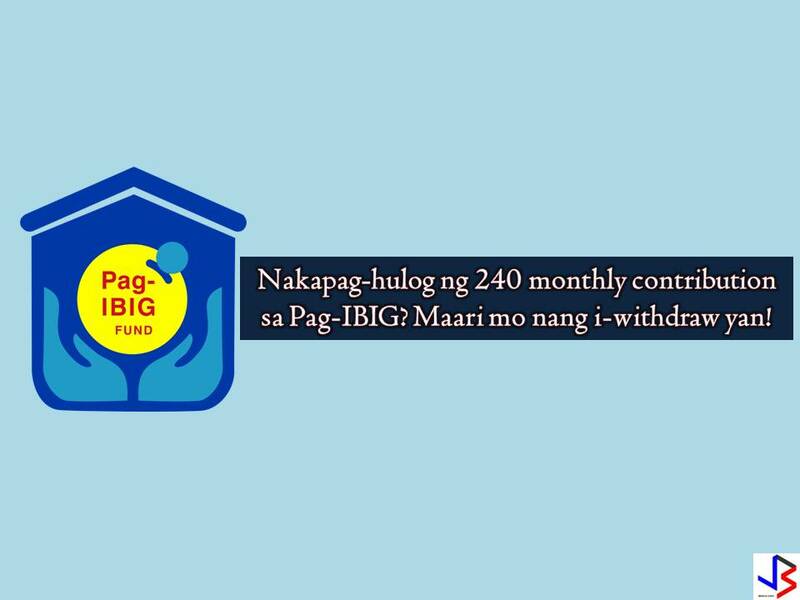 For more information, please visit our site at www.pagibigfund.gov.ph.